We had a little bit of snow, here, in South Carolina this weekend. It wasn't much, but we rarely get snow, and definitely not this early in the year, so it was still pretty magical. We watched snow fall from Friday evening until mid-day Saturday, though not much stuck around for long. I still took the opportunity to snap a few pictures with the tiny bit of snow we did have. (It's actually snowing in these pictures, even though you can't really see it.) Here's hoping we actually get a nice snow sometime this winter. Lorelai seemed to absolutely love snow this year (now that she'll keep her mittens on! haha), so I'm excited to see her reaction if we were to get a few inches that she could play in. 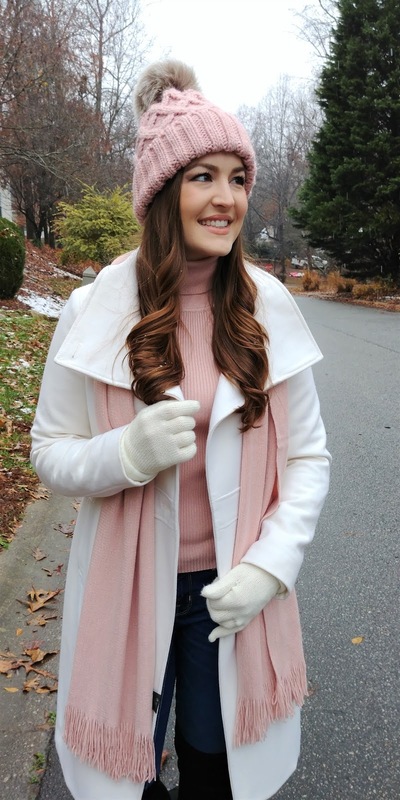 I also couldn't pass up the opportunity to wear this cute pink beanie again, on our "snow day". It's perfect with this pink scarf and turtle neck. I threw this look together while it was still snowing Saturday morning, and I'm so glad I did. I love these colors against the snowy, cloudy day. I hope you had a wonderful weekend as well! Thanks for reading! Thank you so much! Happy Holidays to you too!! Really elegant and chic outfit dear. 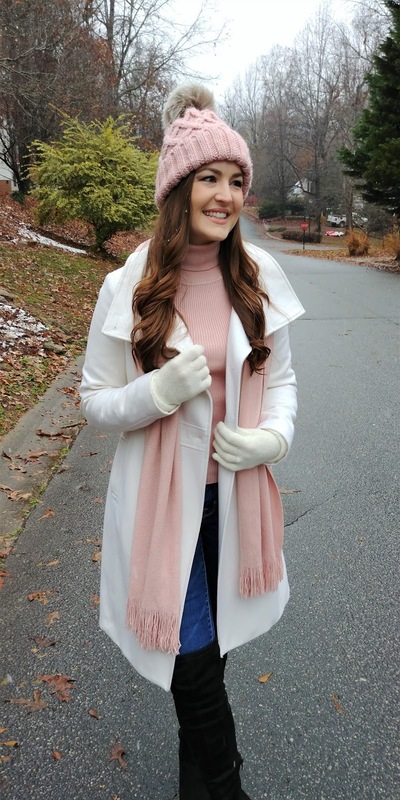 Love the combo of the white coat and pink blush scarf. Really pretty look!